Rotary Club of Harlow - Welcome! Chartered on 29 February 1956, the club currently has 23 members. We meet every Monday lunchtime at 12:15 for 12:30 until 14:00 hour at The Green Man Hotel, Mulberry Green, Harlow. CM17 0ET Tel.01279442521. Additionally we have social functions and fundraising events intermittently throughout the year. Perhaps you know little about Rotary. It started from an idea of Paul Harris, a Chicago attorney, who met with three other local businessmen in 1905 - 'rotating' the hospitality between the four of them, from which small beginnings Rotary International grew and spread around the world. Rotary can enrich your life beyond measure. get a feeling of giving something back that is beyond words. Why Rotary? from RIBI on Vimeo. We have a wide range of events for members and friends including formal dinners, informal meetings with or without entertainment. At our weekly luncheons we endeavour to get interesting speakers on a wide range of subjects. We also raise money for charity with a variety of fund raising events such as sponsored cycle rides, collections at supermarkets and council car parks, and race nights. The money raised is donated preferably to local charities and internationally. We have raised substantial sums for the eradication of polio and for shelter boxes and aqua boxes for disaster relief. In the 1980s Eve Conway was a reporter on a now defunct local newspaper. She was sponsored by this club for an Ambassadorial scholarship and studied journalism in America for a year. Since then she has had a very successsful career in Television. In the next Rotary year 2016/2017 she will be President of Rotary Great Britain and Ireland. We have donated £500 to the British Virgin Islands for Hurricane Irma relief. 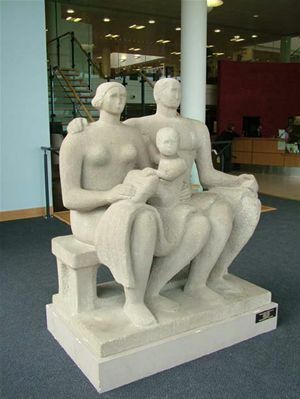 It is the town's unofficial emblem and is on display in the Civic Centre.